Half miniature horse and half pony, but all boss! Jenny likes to take charge in the corral. The fact that she is the smallest of the ponies does not seem to stop her. A lot of people mistakenly think that ponies are baby horses. In fact, ponies are small horses just like miniature poodles are smaller versions of poodles. So Jenny might look like Hobo or Windy but she is not a haflinger. 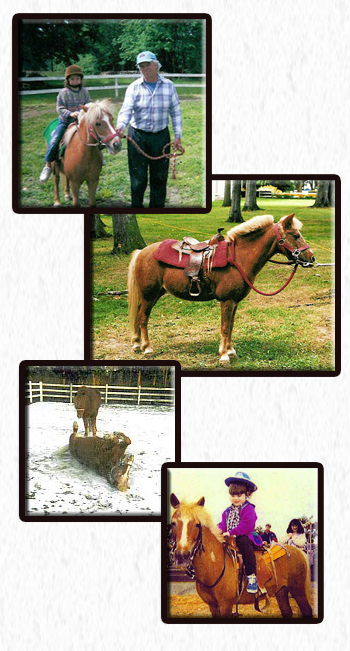 She is 39" high, sorrel in color with a flaxen mane and tail. She is very cute but can be very devilish! When she gets excited, she squeels out "Wheeeeeeeeeeeeeeeee!" As a close personal friend of Mr. Bill's, Jenny likes to travel in the trailer for all of the birthday parties. Give us a call and maybe we can bring Jenny to your birthday party! Teach your pony tricks with this help from ClipClop.com!